SUNNYVALE, Calif.--(BUSINESS WIRE)--Results from the DETOUR I Trial evaluating the PQ Bypass DETOUR System for percutaneous bypass showed promising 12-month durability for patients with extremely long blockages in the superficial femoral artery (SFA). The data were presented as a late-breaking clinical trial session last week at the Society for Vascular Surgery (SVS) Vascular Annual Meeting in Boston, Mass. The trial enrolled lesions longer and more complex than those typically studied in SFA clinical trials, with an average lesion length of 37cm, 100% TASC II C/D, 96% chronic total occlusions (CTO), and 81% with moderate-to-severe calcification. The DETOUR I trial, a prospective, single-arm, multicenter, core lab-adjudicated study, enrolled and treated 77 patients and 81 lesions. Primary and primary-assisted patency at 12 months in all lesions of the DETOUR I trial was 73% and 80%, respectively. Secondary patency was achieved in 94% of patients. Additional safety and effectiveness outcomes include 100% freedom from amputation, 99% freedom from acute limb ischemia, and Rutherford improvement of ≥ 2 classes in 90% of patients. Percutaneous femoropopliteal bypass (the DETOUR procedure) is an entirely new procedure enabled by PQ Bypass’s proprietary DETOUR System. 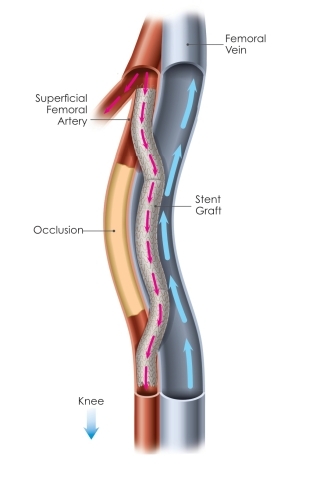 The DETOUR procedure creates a pathway with PQ Bypass’s proprietary stent grafts, originating in the SFA, traveling through the femoral vein, and ending in the popliteal artery, bypassing the diseased part of the artery. The stent grafts re-direct oxygen-rich blood around the blockage, restoring blood flow to the lower leg and foot of the patient. Peripheral Artery Disease, or PAD, is a common circulatory condition wherein adequate blood flow does not reach the limbs due to a build-up of fatty deposits and calcium on the artery walls. One in 5 adults over the age of 60 in the United States have PAD, and more than $4 billion a year is spent on PAD-related treatment within the US1. When this disease reaches an advanced stage within the superficial femoral artery and the popliteal artery, it develops into femoropopliteal occlusive disease. The DETOUR II trial is the first pivotal investigational trial in the United States for percutaneous bypass and is currently enrolling. The trial will enroll up to 292 patients at up to 40 sites across the United States and Europe, and is led by national co-Principal Investigators Sean Lyden, MD, FACS and Chairman of the Department of Vascular Surgery at the Cleveland Clinic, and Jihad Mustapha, MD, FACC, FSCAI, CEO and vascular surgeon at Advanced Cardiac and Vascular Amputation Prevention Centers. The DETOUR II trial aims to expand the body of evidence evaluating the safety and effectiveness of the DETOUR System to create a percutaneous femoropopliteal bypass. More details can be found at clinicaltrials.gov, trial identifier NCT03119233. PQ Bypass, Inc. is a Silicon Valley-based medical device company developing the DETOUR procedure for percutaneous femoropopliteal bypass. Our proprietary DETOUR™ System is a physician-driven innovation, created by Dr. James Joye and Dr. Richard Heuser, world-renowned experts and pioneers in the treatment of peripheral arterial disease. 1 Hirsch, Alan T., Lacey Hartman, Robert J. Town, and Beth A. Virnig. "National health care costs of peripheral arterial disease in the Medicare population." Vascular Medicine 13, no. 3 (2008): 209-215.